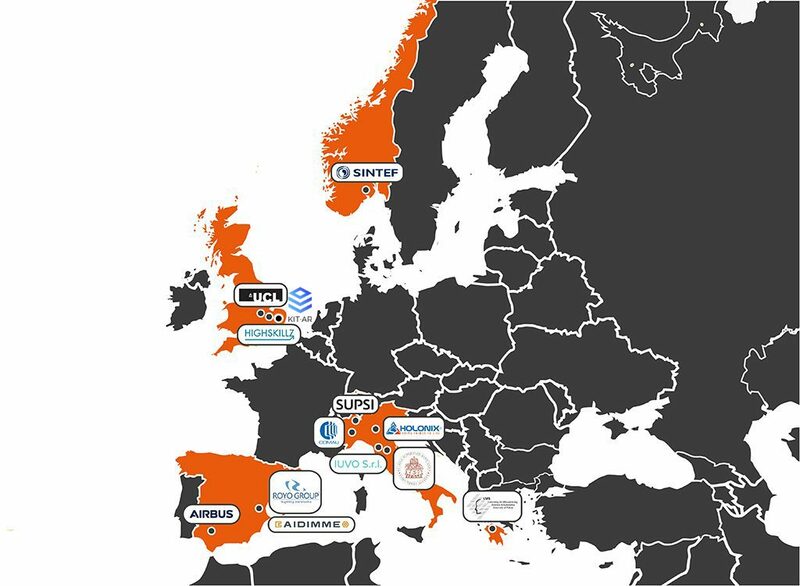 To create a healthy workplace and increase the competitiveness of the manufacturing firms, the creation of an optimal environment for human automation integration and cooperation that harnesses and supports the workers’ capabilities is needed.The HUMAN project,with 12 partners from 6 European countries, aims to define and demonstrate workplaces where automation and human workers operate in harmony to improve the productivity,quality,performance of the factory as well as the worker satisfaction and safety. Objectives to be met are: Improving the integration of humans with their workplace; enhancing the monitoring and wellbeing of human automation co-operation, stimulating and advancing human-automation interaction and co-operation for optimal performance and achievement of complex tasks, establishing adaptable workplaces and tasks to human cognitive and physical skills. These objectives will be achieved by developing and employing physical, conceptual, methodological, technological, and knowledge-based tools. 3 use case companies from the Furniture Manufacturing (ROYO Group), Automation Manufacturing (COMAU), & Defence & Aerospace (AIRBUS) sectors are involved. Proposed advances offered by HUMAN solutions will remove the barriers for:adaptability and flexibility of humans to continuously changing workplaces, alignment of new and complex tasks with human cognitive and physical skills, and synchronization of enterprise goals with human expectations. These advancements will in turn have significant impacts on higher customization, capability, productivity, quality, worker satisfaction, and empower competitive position of the EU manufacturers. - Objective 1 - Integrating HUMANs with workplace: In order to establish an adaptable HUMAN-automation workplace, factory shop floor instruments and level of automation will be aligned with the physical characteristics and capabilitiesof the human worker. Exoskeleton based automation framework will be developed and utilized to enhance the physical and operational capabilitesies of the workers. Wearable devices equipped with sensors will be applied to integrate the human workers with their workplace and tasks. -Objective 2 - Enhancing the monitoring and wellbeing of HUMAN automation co-operation: In order to ensure the wellbeing and autonomy of the workers while keeping high levels of productivity, the cognitive and physical limitations of workers will be alleviated through the adoption and integration of devices and IT solutions. . HUMAN will introduce a new perceiving layer in which HUMAN services “perceive” reality via sensors and monitor the employees, detecting potential safety and ergonomics problems or cognitive deficits. Thus, HUMAN will recognize the need of taking corrective actions for safety and productivity in the short-term as well as the need of re-adapting the workplace in the long-term. Stress and frustration of workers with physical and cognitive limitations are reduced, risky situations are removed, as well as less experienced and older workers aresupported in doing complex or new activities, and performing repetitive or strenuous activities. -Objective 3 - Stimulating HUMAN-automation interaction for optimal performance: In order to synchronize the enterprise performance goals with employees' expectations and skills, HUMAN will create an analytic layer in which new instruments are offered to the employees to interact with the workplace and react to the performance related issues. HUMAN detects the deviations from optimal or expected performances,negotiates with/suggests to the employees for additional (physical or informational) support, and signals the need of intervening on the level of automation. Workers' motivation and self-estimation is increased by incorporating their experiences and skills into decision making, as well as by having control over their tasks. -Objectives 4 - Advancing HUMAN-automation co-operation to achieve complex tasks: In order to achieve seamless alignment between the capabilities of workers and their tasks, the analytic layer of HUMAN will also prescribe the necessary support (again, physical or informational) for matching the worker's capabilities and limitations with their tasks and with the working environment (machine and robots the worker has to interact with), through deployed reasoning tools. This will add to the customization capability with higher operational efficiency as well as improve safety by removing all the possibilities of unsecure interaction between the workers and the automated environment. -Objective 5 - Adapting the workplace and tasks to HUMAN skills and knowledge: Know-how and tacit knowledge of more experienced and best performing workers will be extracted and retained, by encouraging their sharing within a social environment that becomes also the vehicle for improving participation of workers in shaping the work environment. 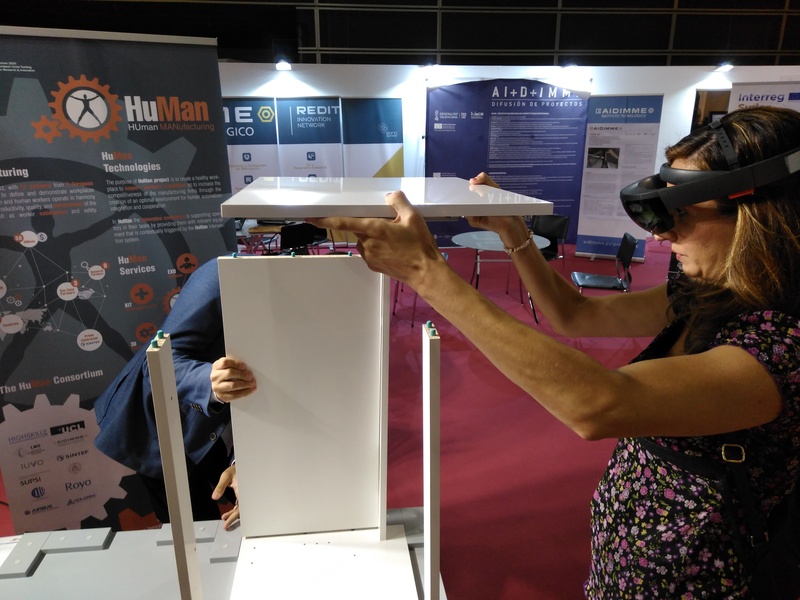 HUMAN will add a participation layer that enables the incorporation of workers' tacit knowledge and experiences into production planning and workplace design, through the combination of new technologies for social networking, and collaborative design. As such, HUMAN will allow the workers to participate in the design, simulation and testing of the new physical environment and of the activities to be executed, creating an engaging experience for young and old workers. 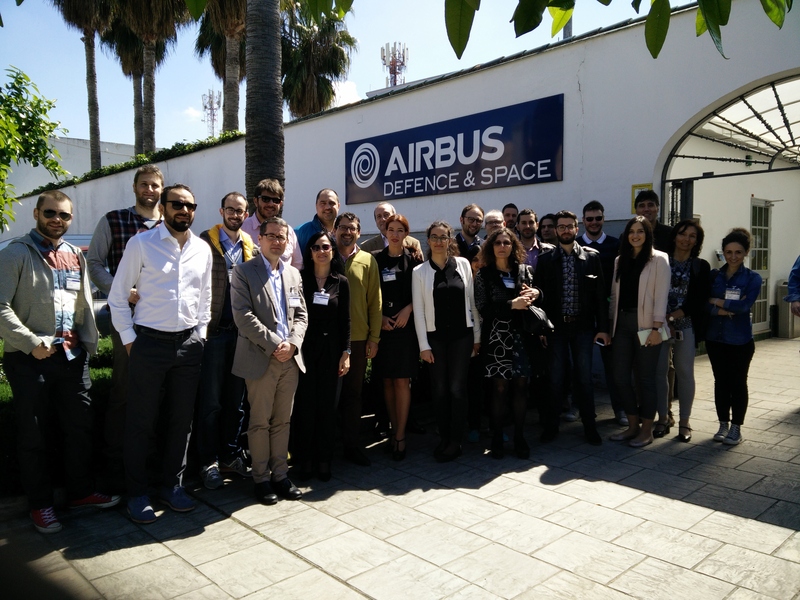 Año 2019: Test and validation of 3 pilots in manufacturing environments: AIRBUS, COMAU and ROYO. 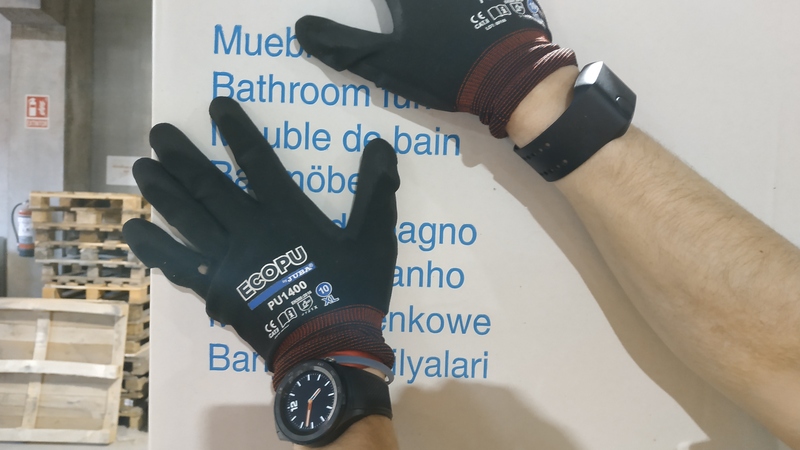 Explicitly in the Royo manufacturing plant, Virtual and Augmented Reality technologies have been validated, as well as the EXO-skeletons, providing important feedback at all times to complete the project as satisfactorily as possible. 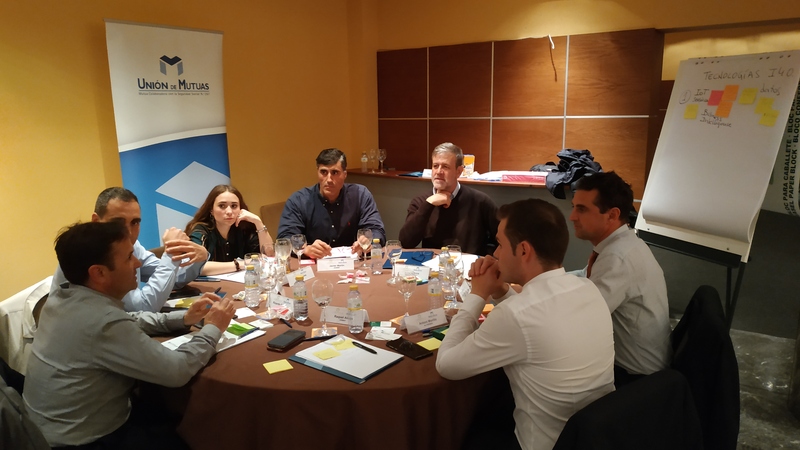 Año 2019: AIDIMME leads the Work Package 7 "Evaluation Studies" preparing and executing the validation in the 3 industrial scenarios, providing feedback to the technical partners for incremental improvement, measuring the usability of the project solutions and reporting results and lessons learnt.